Using traditional sculpting techniques, Jay Rotberg creates a timeless homage to the mother-child bond. Whether through the miracle of birth or the blessing of adoption or fostering, the arrival of a child is a mother's greatest joy. Using traditional sculpting techniques, Jay Rotberg creates a timeless homage to this special bond. The artist's emotive pieces are originally sculpted out of wax then cast in bronze and then recast using bonded resins. He finishes each sculpture with a traditional verdigris patina, a technique used to preserve sculptures since antiquity. 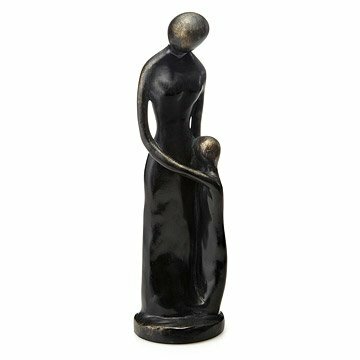 Featuring figures in a deep embrace, this work of heart makes a powerful statement about the unconditional love a mother and her child share. Handmade in the artist's studio in Greensboro, North Carolina. See Jay Rotberg's other sculptures Hugs for All and Wild About You. 14" H x 3.75" in diam. A beautiful piece to treasure forever. This piece is well made, has a significant weight to it, and has such a beautiful presence. It speaks for itself. The sculpture was a perfect way to honor our board chair's work with children. I purchase this for my wife for Mother's Day. She loved it very much. I really liked the idea of the mother and child together in a statue. It is a nice piece of artwork depicting a mother and child embracing. My children loved it and picked it out. It is taller than I imagined, but lovely and a great way for my children to show how much they care. Mom, is not particularly sentimental when it comes to gifts given to her so I was on the fence about purchasing this as a Mother's Day gift. She loves the piece and has even placed it on a pedestal. Great Mother's Day gift...heavy...quality....great meaningful sculpture. I purchased this item for my Wife for Mother's Day, and she loved it. I would highly recommend it!